1. Remember the August Wilson Monologue Competition? Chicago&apos;s Christian Helem placed second, making the city "the only city to have placed in the top three for three years running, and is the only team to have all finalists advance beyond the national preliminary round to the main event." 2. Mortar Theatre Company has Bombs, Babes and Bingo coming up. It&apos;s deemed an "experimental production" and will be at Luna Central (formerly Live Bait Theatre). This is not Babes with Blades, despite the title similarity. 3. Next Theatre has extended After the Revolution through May 19. 4. 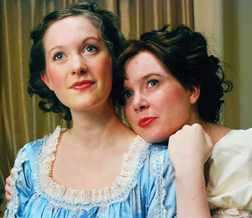 Lifeline Theatre has added a whole month to Pride and Prejudice. 5. Pretty Semitic: Laughing from Right to Wrong, which consists of Jewish and Palestinian comedians, is up at Zanies May 17 starring Jess Salomon and Eman "single-handedly solving the Israeli/Palestinian confliect."